A thematic overview of the lifework of Armand Schulthess (1901-1972) has yet to be created. Armand Schulthess hung more than 1000 inscribed panels in the trees and bushes of the 18,000 square meters of his chestnut woods in the Onsernone Valley in Ticino. Over a period of more than twenty years he transformed the woods into a philosophical garden that chronicled human knowledge and arranged it encyclopedically. Hans-Ulrich Schlumpf collected a wealth of material between 1963 and 1972. He mapped out Schulthess' entire garden and photographed every single object in it. After Armand Schulthess' entire garden and photographed every single object in it. After Armand Schulthess' unexpected death in 1972, his heirs destroyed his entire garden. His house was completely emptied and its household contents, including seventy of so self-made books on sexuality, were burned. Hans-Ulrich Schlumpf, who took the last film shots of the house being dramatically cleared out, was able to save a few of these artistically valuable books. The planned publication of his work documents the garden, shows the house interior and for the first time provides a comprehensive view of the self-made books on sexuality. 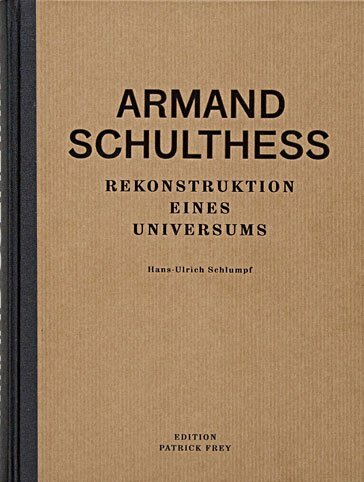 This presentation and precise description finally opens up the obsessive universe of Armand Schulthess so that it can be understood, allowing for meaningful connections to be made between the garden, house and self-made books.